A press release was published today about the nearly $500,000 worth of microbiome research grant awarded to MEBO by uBiome for the "Microbial Basis of Systemic Malodor and PATM Conditions (PATM)", ClinicalTrials.gov Identifier: NCT03582826. 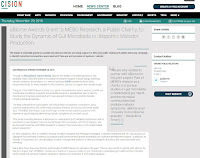 The aim of this study is to support the gathering of comprehensive data to assess the correlation of gut microbiome to physical and psycho-social health conditions. Dr. Irene Gabashvili, PhD, is Scientific Director of MEBO Research and Principal Investigator. A Stanford Medicine and HP Labs alumna, Dr. Gabashvili has authored numerous publications and has led several diverse biomedical and software development projects. In addition, as founder of Aurametrix, Inc., she developed a health-management platform to alleviate metabolic disorders and maximize health and wellbeing. "We are very excited to partner with uBiome for this joint project. Part of MEBO’s mission as a charity is to pursue studies on gut microbiota to understand gut health and the microbial communities that produce malodor symptoms. uBiome is an innovator in microbiome analysis.” - Maria de la Torre"
This very generous grant allows for MEBO to include participants, who experience similar physical symptoms with psycho-social health conditions, from 6 continents of the world, including Africa, Europe, Asia, North America, South America, and Australia. Our profound gratitude goes out to the uBiome team for their very kind and professional support throughout this process.